Sometimes determining your colors can feel like going around in circles. I’m really no closer to figuring out my colors than I was when I started this blog. After playing some more with the fan, I think Bright Spring results in some graying. Bright lipsticks jump off my lips like translucent candy in photographs. I think that I need some clarity and brightness, but not as much as a Bright Spring, at least. 1. If I consider black to be overwhelming (I think sometimes it overwhelms me in photographs because the white balance gets thrown off on my phone camera, but in real life I think it’s not the worst, but it makes my eyes gray): True Autumn. 2. If I think black is good, and that pumpkin is also a good color on me (I have just never tried this color): Dark Autumn. 3. If I do not think pumpkin is good, but black is: Dark Winter. I actually wrote about looking Spring but potentially being Autumn, True Autumn in particular, way back in July. While I feel I’m in the same spot now (see what I mean about circling? ), I do think I have some more knowledge at my disposal. I know some important things about myself. These things include being high contrast as far as natural blondes go and looking awesome in bronzer. Christine Scaman talks a lot about how key bronzing is to the autumn face in this blog post. I know for a fact that my most important step, even more so than foundation (okay, well, covering undereye circles too, but that’s part of my highlighting routine anyway) is highlighting and contouring/bronzing. It really defies all logic. I have the kind of skin that’s so pale I can’t even buy foundation at MAC. You know, the kind of person for whom beauty experts say bronzer will look just look like dirt on their skin. But me? Nope, I wear bronzer, and not even the peachy kind, and all I hear is how nice and healthy and glowing my skin looks. One of the things that has turned me away from Autumns in the past is the brownish lipstick and blush looking like dirt on me. But a couple of months ago, Cate Linden, herself a very pale Dark Autumn, posted about her own DA makeup struggles. It has made me realize that makeup recommendations are definitely not one size fits all. As a non-typical DA (pink overtones, very pale skin), she has had some trouble figuring out the makeup angle. While we would have separate issues–I would say my overtone isn’t particularly pink, but it is very porcelain and clear as hers is–it seems that whatever season I do end up in, unless it’s one where I would basically fit the stereotype, which would be Light Summer, I am going to most likely have to deviate from the standard makeup to fit my own extreme coloring. While we most often associate Dark Autumn with dark makeup looks with very dark, reddish-brown lip colors, there are other colors on the palette that seem like they would work as lipsticks that are not as dark, and clearer and not as brown. 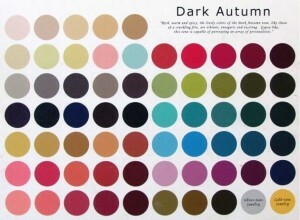 On a Dark Autumn who is as dark as the stereotype, these colors might be too light to work as lip colors. On someone whose starting point is much lighter, however, it may create the right contrast level with the rest of the face. I am not saying I am Dark Autumn, of course. This is just how I would approach makeup if I did turn out to be one. (Look at how gorgeous the DA colors are! I would LOVE to be one.) Just like you address contrast level in your Kibbe according to your season (e.g., an SSu FG doing high contrast in the context of the low-contrast SSu palette), perhaps we also have to expect makeup to look normal on our face according to the coloring we have on our face already, while staying in harmony with our season’s palette overall. Hmmm. it’s just so hard isn’t it?!? Have you ever done an Eblake lip drape? When I did, that got me to LSu (much closer to my eventual LSpr result then my previous efforts. I was completely confused because, much earlier in life, I was color analysed, by someone who was clearly hallucinating, as a winter, so I had no sense of what worked anymore). Having had a look at the old drape photos, the colors I prefer are the raspberry pinks- in particular, I like the one of you in a pink tshirt which you label as soft autumn. And I also really like the light grey, which I originally took as supporting LSu, but actually could successfully belong to a number of palettes except all springs, TA and DA. Now, I can see that the pink shirt is NOT soft autumn, because I have an SA fan (a family member is an analysed SA). The t-shirt is actually much bluer and clearer than the SA fan. To my eye (using online color charts, which we both know are highly imperfect), the pink is much closer to the pinks in true summer or true winter (soft summer is too soft- I know that because another family member is an analysed SSu). From memory, LSu pinks are more watermelon, and the color is not bright enough to be a Bright. Certainly not warm enough for TA…So DW,DA,TW,TSu, of which my faves are the last two options. I just couldn’t see how your hair and eye color could be made from the autumn colors, they both seem cool toned to me. Elea Blake changed their whole system and now I have no idea what season anything’s supposed to be. I think that those old draping photos are especially inaccurate because I didn’t know how to lock the white balance, but all of my photos are taken with an iPhone, which is not the best for keeping colors true to life. I find it handy for seeing skin reactions, but not judging warm or cool in terms of skin or hair. My skin is neutral, leaning slightly warm. I love TW, but I have doubts since it’s a true season, and apparently a lot of TWs have trouble finding foundation cool enough. I also look really, really bad in pure white. I don’t like TSu, but I haven’t ruled it out. Goodness, I just looked at elea blake- my best eye shadow is now dark autumn?!? How confusing. That’s interesting about the impact of the camera. I also go grey if colors are too bright- very odd effect. One thing I am sure of, when you do get draped, it will prob all make sense retrospectively (there is a great shot of a blonde dark autumn on the EB website somewhere, by the way). I spent the last week having a good look at what is available of Caygill, online. Then went through the LSpr 12 tones palette, using it to identify my skin/eye/hair colors. This suddenly clarified for me why I have had less success with straight blues and pinks, I really don’t have those tones in my own coloring. So, I think that once you’ve had a seasonal analysis by an analyst you trust, there is a lot of value in using the palette as the springboard for a Caygill/Zyla type analysis, but doing it without the guide of the palette would be…a lot of frustrating time at the paint shop. I remember when I first tried to do something like that, prior to analysis, I saw myself as having much “duller” coloring (no wonder, since I wore so much black and grey) and thought the colors I saw indicated something like soft summer. I discounted important information (such as having a lot of natural yellow gold in my hair). The other thing I realized retrospectively was that a lot of my ‘not caring too much’ clothes choices were very close to the right colors eg when I bought things to wear casually from the thrift store, they were often orange or green toned, and a lot of my exercise gear was in the right area too! I have no idea what the logic is behind Elea Blake’s new system. I think they made their own system or something, but a lot of the makeup that used to be in one season is now somewhere completely different. I definitely think it will all make sense retrospectively. I’ve been picking up clues here and there, but I haven’t been able to put together the whole picture yet. In terms of Caygill/other systems with custom palettes from body colors, I think I will want a professional custom palette done if I have a hard time fitting into my palette. I’ve never felt the need to get any style recommendations other than the FG guidelines, because they all work really well for me, and are the perfect framework for my personal taste and sense of style. So if I feel like I fit really well within my Sci/Art box, I probably won’t bother. But if it’s more difficult, I’ll probably get a custom palette done. ss, I have been professionally draped with the 12 Blueprints drapes and came a dark winter. When I was draped way back when with the 4 season system, I was an Autumn, if I recall correctly. Take a look at my photos on YLF to get an idea of my coloring. With the actual drapes and the clear light it was so evident what I was. It was also nice because we worked backwards from what did not work for me. The analyst and myself wore grey robes and I had to cover my hair with a grey cloth so we could see how my skin and eyes reacted to the drapes. The funny thing is, I was already wearing my colors because I felt most comfortable in them. Same with makeup. I took all of my makeup for the analysis and we went through it all and pulled out anything that was not right. I am very glad I had the analysis done. I am planning on getting draped by a 12 Blueprints analyst as soon as it’s feasible, so hopefully late spring/early summer. I love seeing a Dark Winter blonde! I would looooove to be DW. As a blonde, do you find that some of the traditional DW makeup, like lipsticks that are very, very dark, look too heavy on you? ss, yes dark lipsticks do not look good on me. My lips are thin and dark lips make them look thinner yet. I do like berry colored lipsticks if they are sheer, though. Interesting! Seems to the fit with the idea that if you are on the lighter side among others in your season, your makeup, etc. will also be relatively lighter.